Well now, what can possibly be written about “A Love Supreme” that hasn’t already been written and re-written a hundred or more times over? On a musical level, probably very little. On its place in history and its importance to jazz and modern music in general; again, very little. It is therefore, a more personal journey that compels me to share my thoughts on this seminal recording, Coltrane’s music being in no small part a major influence on my thinking as a writer, liver of life, and musician. As a headstrong guy in his late teens, I had long since discovered most genres of music. From folk to rock n roll to reggae to ska to punk to classical and all the sub-genres in between, it was always a genuine thrill to be introduced to, or to randomly discover something new to listen to. But jazz? Hmm, not sure about that one. It’s all so… complicated… difficult… busy. A few months further on and I was not only becoming more and more intrigued by this thing called jazz, but I actually found myself enjoying some of it… A strange fascination was slowly but surely turning into a full-blown love affair. And then one day, I purchased an album by this so-called iconic saxophonist by the name of John Coltrane called “A Love Supreme”. At this time in my life I felt like I was continually searching for something, something I couldn’t quite put my finger on. I had begun to learn about and practice meditation, I read a lot, I philosophised, I drank a lot. And I was writing poetry, falling in love, and playing the guitar… not necessarily in that order. 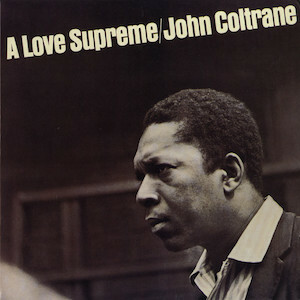 And when I first listened to “A Love Supreme”, it felt nothing short of a revelation. It was deep. It was spiritual. It spoke directly to me. It was as if I had found something that awakened my soul. I wasn’t even born when Coltrane took McCoy Tyner, Jimmy Garrison and Elvin Jones into the studio to record this album. I’ve just turned 50 now, how mad is that? To think that it took so long for me to hear this music seems somewhat odd now, yet looking back I realise it was all part of life’s unraveling journey for me, as it was for Coltrane. In his case, he had reached a level of brilliance in thought, musicianship, mind and spirit, his astonishingly powerful and emotive music reflecting the place he had reached as a human being. To me, I can still hear the ever-searching elements in his music, but he also seems to have found a place of knowing, and of sharing. And there also appears to be a healthy balance between rejoicing and inquiring, still being open to new twists and turns, still embracing change, doubt and insecurity, with loving-kindness and a passionate need to discover more and delve deeper into the wonders of the universe and the spiritual awakenings that lie within. As a guitarist/singer/songwriter, “A Love Supreme” had a profound effect on me. It gave me something I had previously lacked; confidence. Performing at that time during the late 80’s, early 90’s, I was told I was either 20 years too late or 20 years too early. As it happens, both turned out to be correct. I was often criticised for writing songs that didn’t have a proper chorus, or didn’t fit a certain mold, or that couldn’t be categorised within a certain genre, or that were too heartfelt, too introverted, too long, too whatever whatever whatever. Listening to Coltrane gave me belief. It gave me the strength to continue with what I felt was right, with my own journey, what I had to do, even if I was making music in the wrong era. I remember a particularly horrible gig, one of those where your manager books you into completely the wrong venue with the wrong audience. Several people walked out after the first number… incredibly daunting. And at that point I actually heard Coltrane’s blowing on the intro to “Part 2: Resolution” singing in my ears. I actually laughed out loud. The manager of the club came onto the stage to reassure me; “It’s ok son” he said, “you do what you do. The ones that want to listen will dig it, the others… well it’s their loss.” And that horrible gig became a great gig. It really doesn’t matter what genre of music you choose to play or listen to. If you can hear the man in the music, that’s good enough for me. “A Love Supreme” hit me as being so stunning in so many ways, but for me at that time “Part 4: Psalm” was the real eye opener. How could anyone capture such soulful beauty so perfectly in their music? Because they feel it, they live it, they breathe it… they are it, can surely be the only answer. A lesson in life perhaps? What you put in, you get out. Maybe. Whatever your take on how the music came to be, you simply can’t ignore the fact that this, and of course the album as a whole, stands as one of the greatest musical achievements man has had the pleasure of witnessing. It no doubt brings different things to different people. To me, it still keeps on giving. Always inspiring, touching, thought-provoking, moving, daunting, beautiful, crazy, awesome, soulful ,spirited and free. In the extremely unlikely event that you’ve never listened to this album, go and get it now. Don’t delay for one second, open your mind and let the music transform you. For the rest of you, when you sit down tonight, find yourself an hour to sit and listen once more. Clear your mind, try and imagine you’re listening to this for the first time. Or take a trip down memory lane to when you did first listen to it. Enjoy it with a renewed ear, and let Coltrane’s masterpiece once more sweep you off your feet.